Summit Professional offers the perfect solutions for storing and displaying your favorite bottles in thoughtfully featured, elegantly designed wine cellars ideal for the home. The SWC1987T is a unique triple zone wine cellar with three independent temperature zones. Sized at under 24" wide and 27" deep, this unit can be used for built-in installation or freestanding use. It comes with a jet black cabinet and double pane tempered glass door complete with a seamless stainless steel door trim and pro style handle. The stainless steel kickplate finishes the professional look. We include a factory-installed lock for added security. The door is user-reversible, allowing you to adjust the door swing as needed. The interior features three separate temperature zones for true storage versatility. The lower zone operates between 54º and 72ºF for optimum storage and preservation of red wine. The middle chamber has a 41°F to 54°F temperature range best suited for white or sparkling wine generally served at colder temperatures. The shelving in this section is spaced with more room to better hold wider champagne bottles. The upper zone has a wider temperature range (41°F to 72°F), allowing you to optimize your storage according to your collection's needs. 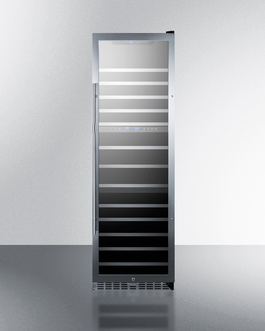 This unit can store up to 133 standard Bordeaux style bottles. Capacity varies based on bottle style and size, but the shelving is also designed to be easily removed for larger sizes that may need more clearance. Summit Professional series wine cellars include deluxe full-extension shelving on ball-bearing tracks, making it easier to access all stored bottles. The wooden shelves feature stainless steel front trim for an elegant look that complements the door and kickplate. White LED lighting is included in each section for an attractive and efficient view. The digital control panels ensure intuitive temperature management, with a readout viewable in Celsius or Fahrenheit. This unit comes with two active carbon filters that help in reducing odors that might be damaging to your collection. With its versatile design, innovative features, and luxurious style, the SWC1987T brings new possibilities to your home wine collection.